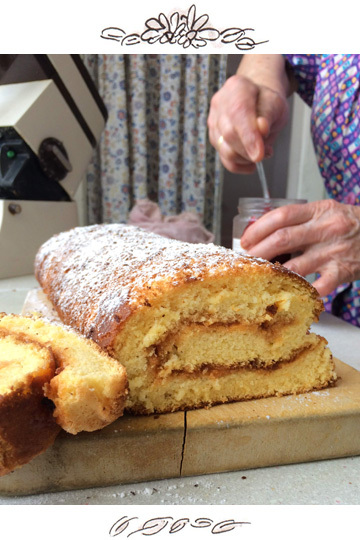 Today I share with you the secrets of my Grandma’s super fluffy apricot jam roulade. 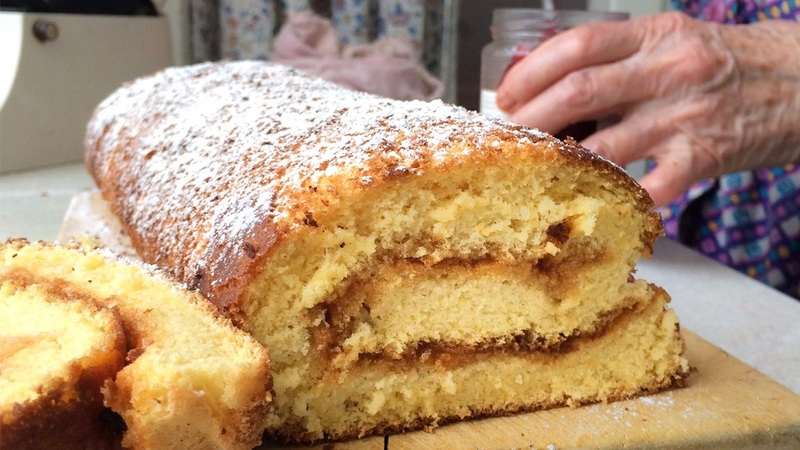 A jam roulade is a very popular and traditional cake with spongecake dough. You might also know it under the name roly poly, sponge roll or jam roll. She uses more sugar. A lot of jam roulade recipes need the same amount of flour and sugar. My granny though uses 50% more sugar than the standard recipes! Granny also uses more butter. She only uses really fresh eggs. She folds in the ingredients carefully and bit by bit. This way, she can adjust the amount of flour and sugar, depending on the size of the eggs. She uses homemade apricot jam. Grease baking paper with butter and dust with flour. Separate eggs, beat snow very stiff. Mix flour, caster sugar, baking powder and vanilla. Bit by bit, mix egg yolks with snow. Add the remaining ingredients and the butter. Put on baking sheet and bake at 200°C (~390°F) in a preheated oven for about 10-15 minutes. Immediately after baking, spread jam on top. Use the baking paper on the underside to form a roll. Shortly before serving, sprinkle with caster sugar. If the biscuit is filled with a cool mixture (for example with curd cheese) do not brush immediately after baking. Top the baked dough on the top with a baking paper, roll it up without filling. Let it cool and then roll back up carefully, remove upper baking paper. Brush with filling and roll up again. Hello, my name is Angelika. I am passionate hobby cook and write here on the blog mainly about the classic Viennese cuisine and reveal the secret recipes of my grandma. In addition to my office job in an engineering office, I run the Foodblog Vienna Sunday Kitchen and organize cooking classes with Vienna Cooking Classes in private Vienna apartments.